It’s 5:30 am on a Saturday morning, and Manitoba’s farmers are arriving at the site of Le Marché St. Norbert Farmers’ Market. They’re bringing the bounty of the fields to the tables of the city, as they do every week, rain or shine, from the May long weekend through to the end of October. 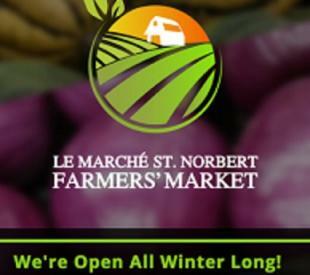 Le Marché St. Norbert Farmers’ Market is Manitoba’s largest and best-known farmers’ market. Featured weekly at the market are locally grown produce, delicious fresh baking, homestyle jams and preserves. There are wonderful homespun crafts, uniquely designed jewelry, fresh cut flowers and much more. The colours are vibrant, the produce field-fresh. Lively chatter and friendly faces welcome residents and visitors alike, every week of the season. In 2014, we became Manitoba’s first Online Market, providing Manitobans with the opportunity to find locally produced products all year round. Our Online Market supports Manitoba’s producers through those cold winter months!